Standard Aluminum Foil Rolls are a multifunctional product that can be used in restaurants to wrap food, seal food, cook food, line pans, and more. Restaurant supplies like aluminum foil help to keep foods warm and sealed. They are also great for grilling since they protect the food from burning and cool super quick. Foil can be used to wrap cooked meat off the grill for eating later. Foil is also better for covering cakes than plastic wrap. Another nice feature of aluminum foil is that it can be recycled making it good for the environment. Handi Foil Standard Medallion - 12 in. x 1000 Ft.
Handi Foil Standard Medallion - 18 in. x 1000 Ft.
Handi Foil Standard Medallion - 18 in. x 500 Ft.
Handi Foil Standard Roll - 18 in. x 1000 Ft.
Handi Foil Standard Roll - 18 in. x 500 Ft.
Handi Foil Standard Roll - 12 in. 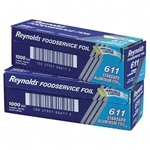 x 1000 Ft.
Standard Aluminum Foil - 12 in. x 1000 ft.
Our wholesale Standard Aluminum Foil Rolls are used in restaurants, delis, bakeries, and other foodservice businesses throughout the country. Besides using for cooking and baking, aluminum foil can be used for other purposes, such as sharpening scissors, cleaning off rust, taking tarnish off silverware, painting (protecting knobs and handles, quicker cleanup), and reducing static cling when using clothes dryers, just to name a few.